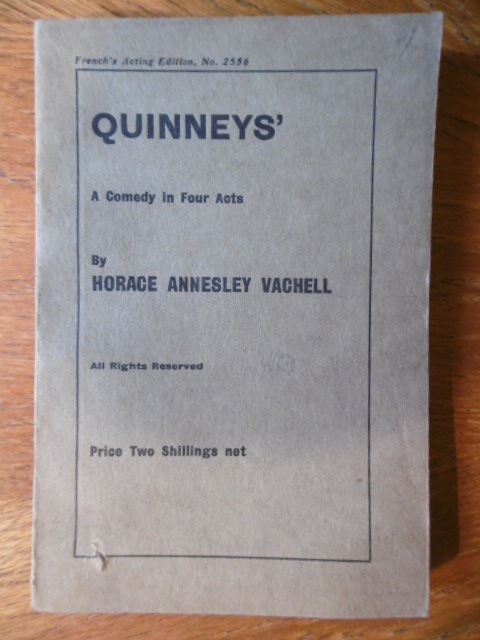 I’ve been undertaking some further research on the play ‘Quinneys’ – as readers of the project blog now know, I hope – it’s the fictional story of the life of an antique dealer, Joe Quinney, written by Horace Annesley Vachell in 1914, and made into a play in 1915 – see previous blog posts on ‘Quinney’ and on Thomas Rohan. 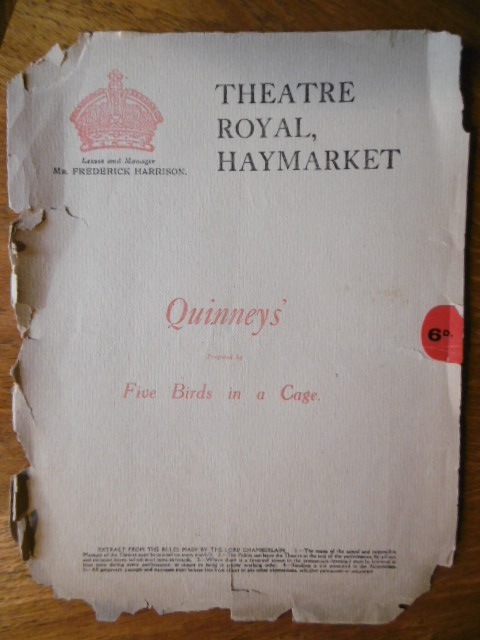 In a recent post I posted about the playbill for Quinneys, at the Theatre Royal, Haymarket, which was staged in 1915 (see blog entry for December 2015), and drew attention to the fact that the London antique trade had supplied much of the antique furniture and etc for the stage-set. 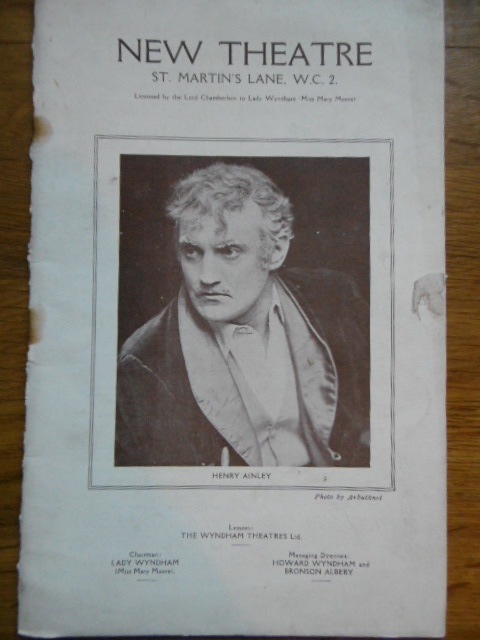 I recently found another playbill for Quinneys, this time from 1925, for a staging of the play at the New Theatre, St. Martin’s Lane, London. Playbill, ‘Quinneys’, New Theatre, St. Martin’s Lane, London, 1925. Image, copyright Antique Dealers project 2015. 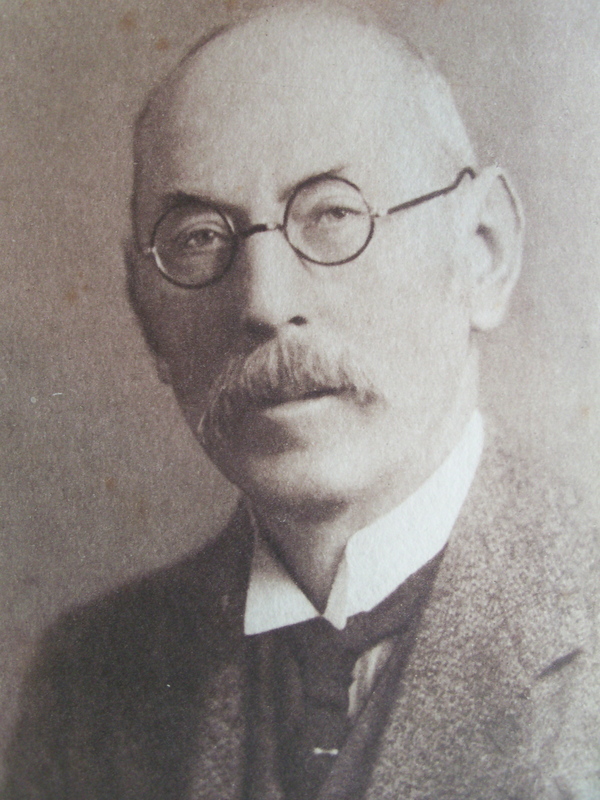 Henry Ainley as ‘Quinney’, c.1915. 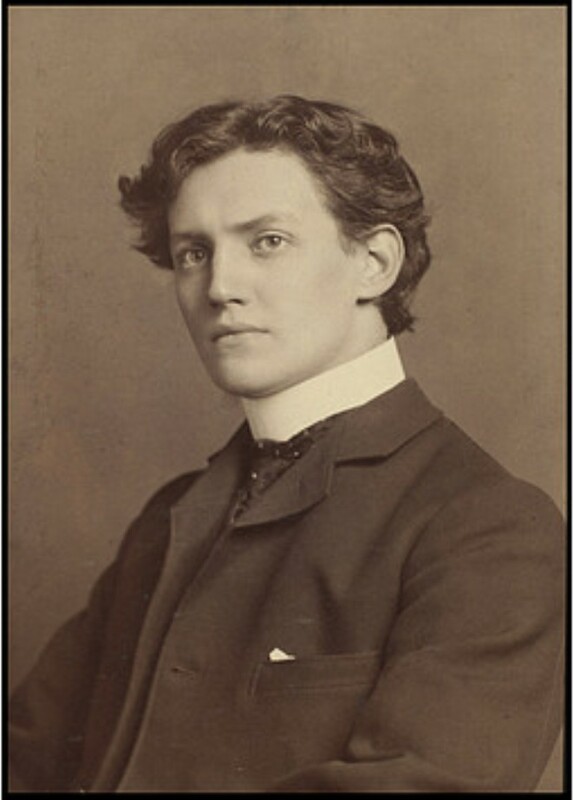 As in the 1915 play, the lead (Joe Quinney) is still played by the Shakespearian actor Henry Ainley (looking much older, as one would expect, to his youthful self in the 1915 photograph – see above, and in our earlier blog post). 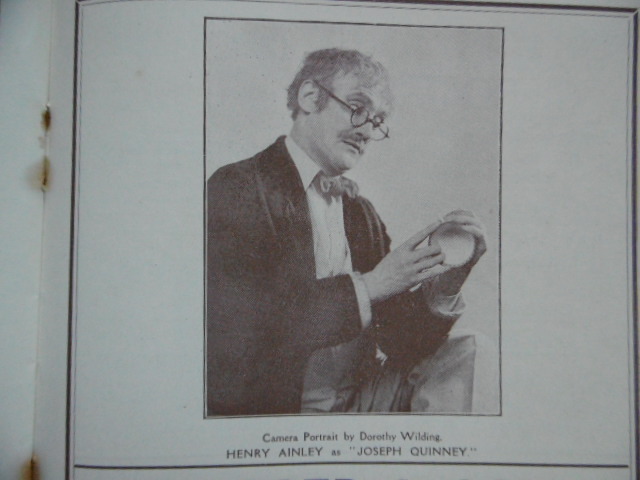 Henry Ainley as ‘Quinney’, 1925; ‘Camera Portrait by Dorothy Wilding’. Image copyright Antique Dealer project 2015. The 1925 playbill is a much more extensive document than the 1915 one (which was effectively just a single, folded, page), and amounts to 12 pages, mostly of advertisements. 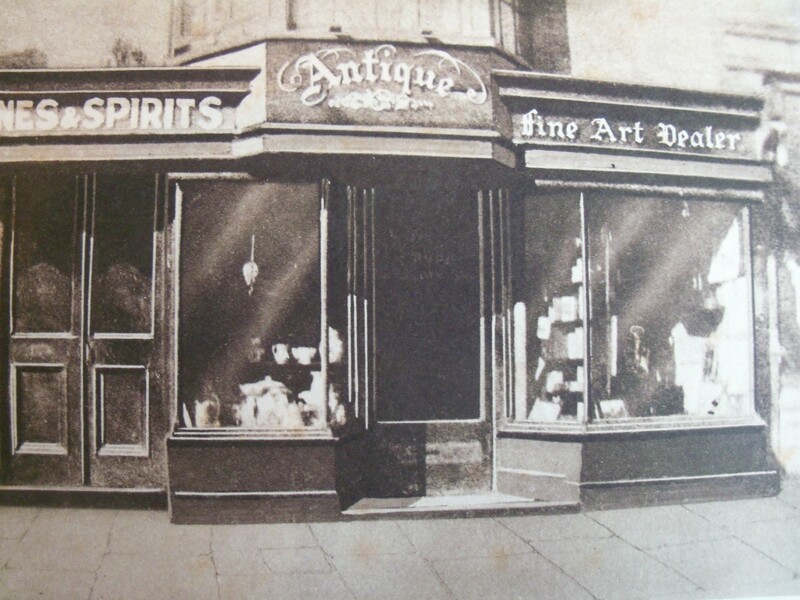 The adverts, as one might expect, included many of the leading antique dealers of the day; including the antique glass specialist Arthur Churchill (then in Dover Street); Joe Sale, of Kensington Church Street; John Sparks; Dreyfous of Mount Street; Frank Partridge; Charles J. Pratt; M. Harris & Sons; Hotspur Ltd; Stoner & Evans, the ceramics specialists, as well as lesser know dealers such as C. Rose, Edith Lee, C. Griffiths, Mrs. Mellor, and H. Fisher. 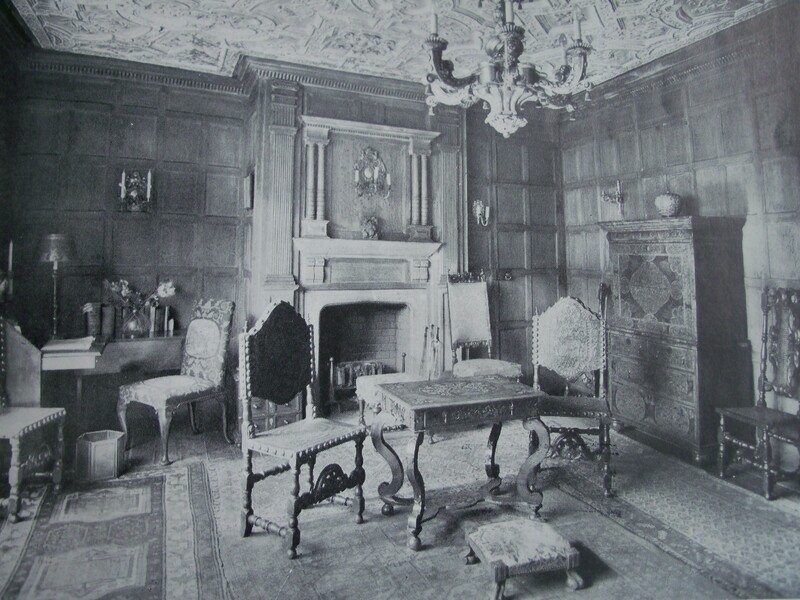 And, just as the 1915 play had antique furniture and objects loaned by dealers, (in 1915 it was Keeble, Parkenthorpe and Spillmans), in 1925 the antique furniture for the stage-set was supplied by leading antique furniture dealers Moss Harris & Sons, New Oxford Street. If anyone knows anything else about the staging of the play ‘Quinneys’ we would be very interested to hear! Oh and Merry Christmas to all our readers of the project blog! Even more on Thomas Rohan! The blog posts on the antique dealer and author Thomas Rohan (see previous posts) are becoming quite a theme – thanks again to John Cresswell who very kindly posted photocopies of some newspaper clippings reporting the death of Rohan in 1940, as well as some photos of the house that Rohan lived in during his time in Bournemouth in the 1930s. This Christmas, one of my presents (thank you Clara!) was a small (tiny actually!) 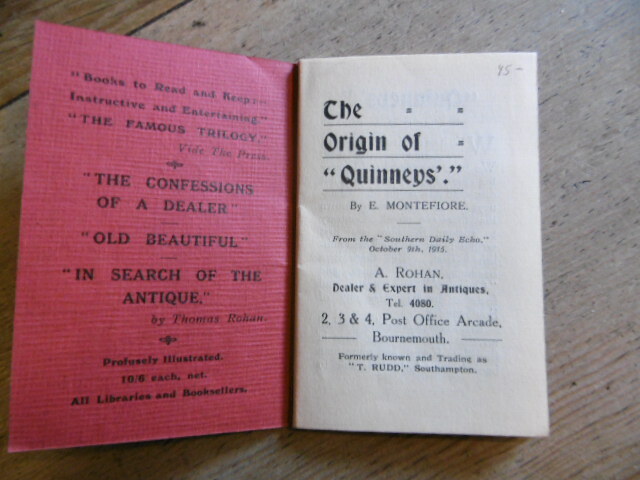 booklet entitled ‘The Origin of Quinneys’ (by E. Montefiore) – it is undated, but perhaps c.1940 when Rohan died? 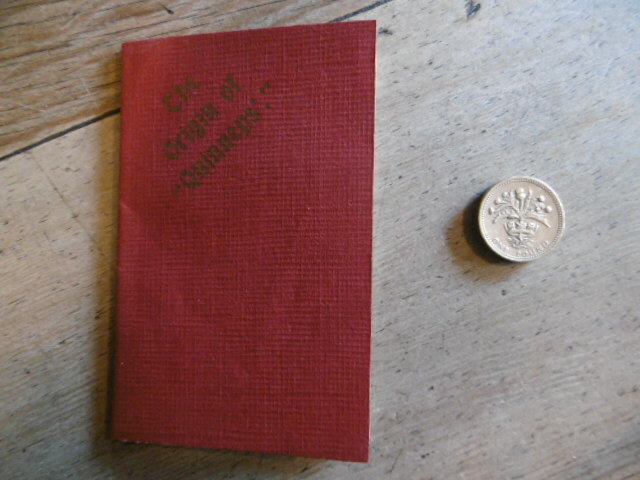 The little booklet, which came all the way from a book dealer in the USA, rehearses the story of Rohan being the basis for the character of ‘Joe Quinney’ in Horace Vachell’s novels (see earlier blog entries for details on this). The booklet, as you can see, really is a tiny thing – here photographed next to a UK pound coin. ‘How I took the trading name of Rudd was in this fashion. For family reasons I was asked not to use my own name as a dealer. I rather resented this, but for peace and quietness agreed. Just before opening my little shop, I went to a sale, and bought a grandfather clock. The auctioneer asked, “What name?” I called out my own name of Rohan. He said, “Rudd?” I said, “Yes, put it down R U double D” and from that time for fifteen years I was known as Rudd.’ Confessions of a Dealer, p.71. Newspaper reports on the death of Rohan in 1940 suggest that he was ‘the scion of the noble family of France, the Prince and Ducs de Rohan’ (Bournemouth Echo, 27.1.1940) – so it may have been that associations with the ‘trade’ were not seen to be appropriate when Rohan first set up as a dealer in 1903. Whatever the reason, Thomas Rohan is a fascinating example of an early 20th century antique dealer! 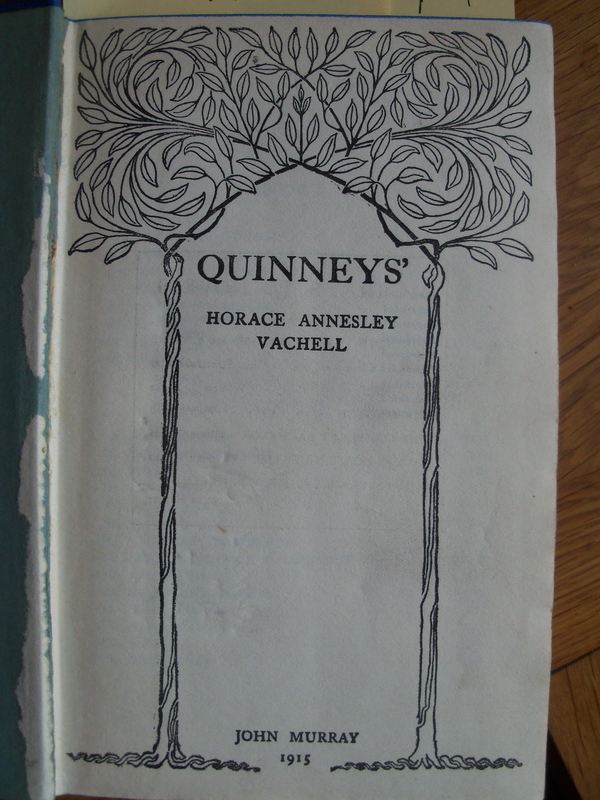 Some of you may be aware of the novels about an antique dealer called ‘Quinney’, in the writings of Horace Annesley Vachell – Vachell published a number of novels about the adventures of Quinney, starting in 1915, with the original novel, called ‘Quinney’s’. The novels are interesting period pieces and tell us a lot about the characterisations of the antique dealer in the first half of the 20th century – and part of the research for the current project will be focusing on an investigation of these literary constructions, and their meanings and influence on the characterisation of the antique dealer in the wider public domain. One interesting result of the popularity of Vachell’s novels is the number of real dealerships called ‘Quinneys’ that emerged, right across the country – we’ve traced at least 11 so far; as far as I know there is only one dealership named ‘Quinnney’s’ left trading…in Warwick. The novels themselves are fascinating, and contain lightly veiled characterisations of real dealers – a ‘Mr Pheasant’ is quite obviously an allusion to the well-known London dealer ‘Partridge’ for example – and there are several other fictional dealers that seem to relate to factual ones – ‘Primmer of Bath’ could only be Mallett I suppose, and ‘Gustavus Lark’, who ‘wore a cut-away coat, with an orchid in the lapel of it’….and was ‘smoking an imposing cigar’, in one scene from the original novel ‘Quinneys’…is this the infamous Duveen?…. Here’s a photograph of Thomas Rohan, and an image of his first shop: Rohan, as I mentioned, was also a prolific author, publishing many books, mainly on collecting, such as ‘Old Beautiful’ (1926)…as well as writing novels – his novel ‘Billy Ditt, the Romance of a Chippendale Chair’ (1932) traces the fortunes of a chair, made by Thomas Chippendale in the 18th century, as it passed through various hands – I can’t say it’s a literary masterpiece, but it is an intriguing book, and of course, is crucial to our cultural understanding of the history of the antique trade itself. 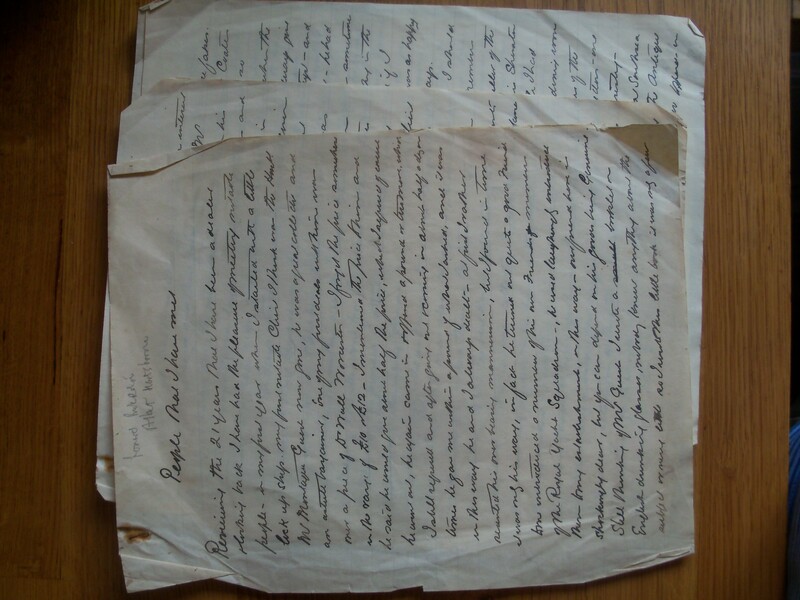 The MS is only a short document, entitled ‘People that I have met’; it is undated and unsigned, but seems to date from c.1920, and I am certain that this is part of the original writings of Thomas Rohan. It contains musings on his life as a dealer, and on the collectors that he sold antique objects. Quite apart from this being a lucky and serendipitous find, it’s also now a brilliant resource for the antique dealer project and will play a key role in the research into the literary characterisations of the dealer…watch this space!